Culture | The Thin Red Line tiles visually expands the space and contributes to diversity. 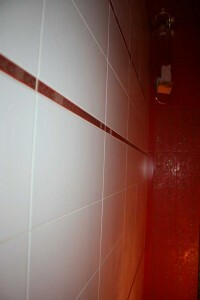 The Thin Red Line tiles visually expands the space and contributes to diversity. White door on a red background.The combination of black and red tiles with gold ornament makes a separate toilet interior ensemble.